Sexual harassment at workplace is often brushed under the carpet. As a society, we live in a state of denial. Either we choose not to see the elephant in the room or maybe we are blind. In either case, justice is a casualty. The passing of The Sexual Harassment of Women at Workplace (Prevention, Prohibition and Redressal) Act,2013 was expected to serve as a guiding light for fighting the evil. Entrenched patriarchal notions and a culture of silence act as obstacles in the path of justice delivery. Law is only an instrument for social change. Implementation is key to the success of any piece of legislation. This holds true for law on sexual harassment as well. 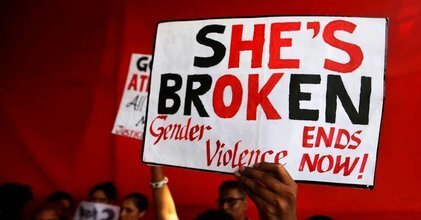 It is time to speak up for victims of sexual harassment in India. Culture of Silence A victim of sexual harassment at workplace fights a lonely battle in India. What is worrisome is the fact that her colleagues in order to earn some brownie points from the employer often side with the boss or supervisor. To speak up against sexual harassment, one requires courage and there are several patriarchal notions, entrenched biases and prejudices which prevent a victim from speaking up. Often, a victim lives an entire life without coming to terms with the abuse. The law on the subject has been passed with lot of hope but we need to realise, that it is the victim who has to speak up in the first place. The law comes into action only when a formal complaint is lodged. The journey from incident or incidents of sexual harassment to filing of complaint is ridden with official obstinacy, procedural hiccups and further harassment. Often, a victim of sexual harassment has to cry hoarse to register that yes, indeed she was harassed. Denial is the first line of defence for any employer or perpetrator. She may have to face character assassination. This is the harsh reality. If we sincerely hope to ensure that this evil may be effectively curbed then we need to help the isolated victim in such cases and empower her with informed discussions and awareness campaigns. Importantly, the aggrieved woman needs to be reassured that justice will be swift and definitive. There is a need to replace culture of silence with culture of courage and boldness in cases of sexual harassment at workplace. The Sexual Harassment of Women at Workplace (Prevention, Prohibition and Redressal), 2013 attempts to provide a safety net to a victim. It provides for formation of an Internal Complaints Committee decide upon complaints of sexual harassment. Section 19(a) of the statute mandates the employer to create a safe working environment. Sadly, it doesn’t provide for any kind of punishment for the Head/Supervisor of an organisation or department if any case of sexual harassment is reported. It also doesn’t make him accountable for lapses in not initiating an inquiry as required under the statute in time. Also, the statute doesn’t provide for any kind of psychological counselling help to a victim. It provides that an ‘aggrieved woman’ may be given long leave or may be transferred but doesn’t suggest anything concrete to assuage and balm her injure soul and mind. Monetary compensation is also given in cases but we need to look at alternative forms of rehabilitation of the victim to a normal course of life. Severe damage is caused to the moral fibre of a victim. Her self esteem, and dignity is damaged. There is an urgent need to raise this issue at policy level and initiate may be something like a 24×7 scheme catering to the psychological needs of a victim of sexual harassment. Also, what is deeply disturbing and unnerving for a victim is the fact that often the perpetrator of harassment is sheltered and receives almost no social condemnation. It is time we adopt novel ways to make the perpetrator realise the gravity of the offence. Compulsory hard labour or tattooing (to publicly shame the perpetrator) may be introduced as alternative forms of punishment. Often, procedural delays happen due to complicity of official staff. There is a need to check that by making necessary rules. Woman is at the receiving end in cases of sexual harassment, while it should be the perpetrator who needs to be booked swiftly under the law. As a society we need to grow beyond Bollywood. A popular news magazine, “Outlook” recently ran a cover story “#Me Mum: Why is Bollywood silent?” on the heels of Harvey Weinstein scandal hoping to ignite Bollywood deluge of sexual harassment complaints. However, we need to remind ourselves that sexual harassment may take place anywhere. In schools, hospitals, cinema halls, restaurants or at any other place. We need to understand women at the bottom rung of society are at a higher risk of facing sexual abuse and harassment. Yes, we need to speak up. But not for Bollywood alone. We need to speak up for our wives, sisters, daughters and friends and they may be working in a brick kiln, government school, hospital, grocery store or any government or non-governmental office or establishment. Are we sufficiently prepared to curb sexual harassment at workplace?